The following list of marine weather publications is provided to assist the boating and yachting community in determining what weather products are available and how to make the best use of them. Never lose sight of the importance that weather plays for those of us who head offshore for recreation or for work. It is one of the most important factors regarding the safety of vessel and crew. It has the ability to turn an enjoyable day on the water with family and friends into the proverbial nightmare of a life threatening situation. Please note: many of these files are quite large and will require substantial time to download over a dial up connection. Great Lakes Regional Products (Great Lakes Storm Summary, Great Lakes Freeze-up Outlook, Great Lakes Ice Outlook, Great Lakes Break-up Outlook, and the St. Lawrence Freeze-up Date Outlook). 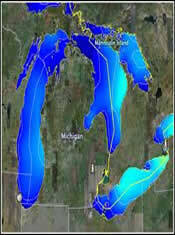 Great Lakes Marine Products (Open Lake Forecasts, Nearshore Forecasts, Lake Shore Warnings, and Lake Shore Statements). Also dissemination information including times and methods that this information is provided to the Great Lakes Mariner. File Size - 42.9 Kb. Also dissemination information including times and methods that this information is provided to the Mariner. File Size - 84.9 Kb. The schedules contained in this publication were obtained from official and unofficial sources. The information herein may not be complete or accurate. For ease of use, all stations are listed by WMO region, in alphabetical order, by country and location. All times listed herein are Universal Coordinated Time (UTC), unless otherwise indicated. 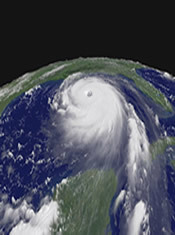 For information on weather broadcasts worldwide, also refer to NGA Publication 117, the Canadian Coast Guard Radio Aids to Navigation (Canada Only) and the British Admiralty List of Signals, which are updated through Notices to Mariners. Information on these and other marine weather publications may be found in Appendix D.
This document also includes information on how to obtain National Weather Service text forecasts, graphic forecasts, and marine observations via the Internet and e-mail. File Size - 393 Kb. This Publication provides the radiofacsimile user with a list of the products disseminated and an introductory guide in how to interpret each chart. The following products address the common needs and requirements of professional mariners engaged in transoceanic crossings and offers the maritime community complete and timely graphic products to support navigation safety and operating efficiency. 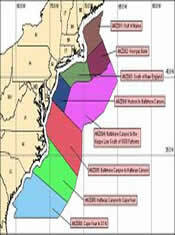 Three primary types of products are issued: upper air 500 millibar (mb) charts, surface pressure, and sea state charts. Additional charts include sea surface temperatures (SST), tropical streamline and surface analyses, and meteorological satellite imagery. 02 October 2013 Update. File Size - 838 Kb. In the Atlantic Basin, they are called Hurricanes; with a sudden fury and unpredictable behavior, these violent, spiraling masses of thunderstorms, high seas, and devastating winds have been a nemesis to sailors since time immemorial. Today, as more sailors take to the sea, the potential impacts and effects that hurricanes could have on mariners is as important as ever. This guide will hopefully aid the Mariner in understanding the complex structure and behavior of tropical cyclones in the North Atlantic Ocean. Once armed with this knowledge the mariner can be better prepared to "weather the storm" or better yet, avoid them altogether. Finally, this guide will discuss some ship routing and hurricane avoidance options with the intention of highlighting critical thought processes, risk analyses and required actions that should be considered in order to remain safe and secure during the threat of a tropical cyclone at sea or in port. File Size - 1.2 Mb. 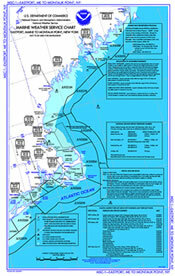 Marine Weather Service Charts (MSC) published by NOAA. These are weather service information charts covering all U.S. waters including Pacific Island Territories and are broken down by geographical region. These charts provide a lot of marine weather related information including frequencies, schedules and locations of stations disseminating NWS products. They also contain additional weather information of interest to the mariner.